Are Your Future Passwords Hidden In the Jiggling of Your Eyeballs? Eye scanners have always been one of the security devices people think of when they think "high-tech" and "high security." But they're not perfect yet, some can be fooled with contacts or even pictures, but new pushes into detecting your personal eye jiggle could change that. 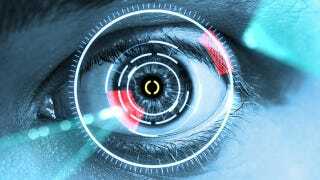 The eye-movement system, being developed by Oleg Komogortsev, of Texas State University-San Marcos, would add a whole other layer of security to a normal iris-scanning system. Komogortsev's system tracks two specific things: your eyes' "fixations" which is when your eyeballs chill out and sort of stare at something for a little bit, and your eyes' "saccades" which is when your eyes are darting from point to point. By calibrating a login mechanism not only with an iris pattern, but also your own personal eye-eccentricities, you're adding something to the mix that's practically impossible to fake. There are still some details to work out however, like whether your eye movements change as you age, or how much your eye-dentification can be thrown off by your emotional state, or other factors.